America’s children are getting increasingly less outdoor exercise, studies show. This problem contributes to childhood illnesses and obesity. Furthermore, it is made worse with the approach of winter. As the temperatures drop, and snow moves in, things get rough. Traditional play areas simply become unusable. Yet, artificial grass encourages outdoor activity. How so? Let us Explain. In short, NewGrass® can help. It is easy to create year-round play areas with our products. In fact, it is one way families and schools make a difference. With synthetic grass, families and community groups directly address childhood obesity. Kids have incredible spaces which encourage movement. After all, part of getting children to play outdoors is creating a space that invites them too! Kids love bright colors. Artificial grass is no exception. The vibrant green color is irresistible to to kids. It practically screams for them to frolic and play in any weather!! Further underscoring this idea is a quote from our NewGrass president. 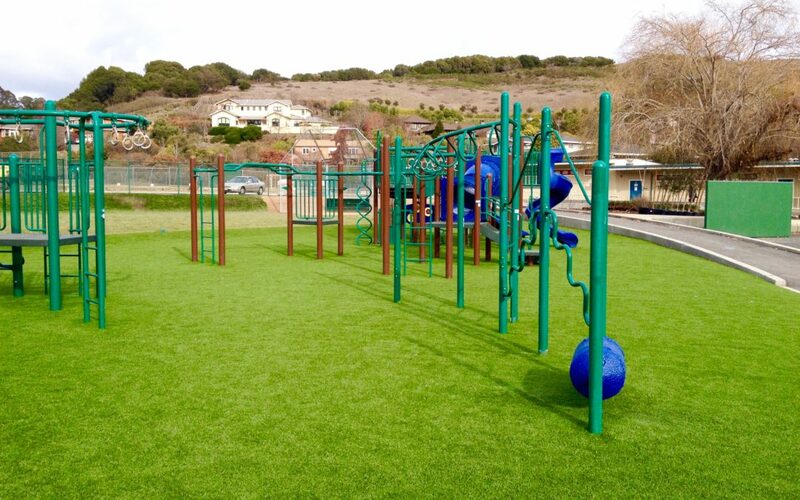 He says, “We’ve had great success with NewGrass® on all kinds and sizes of play areas. And more success in all kinds of climates and weather conditions.” NewGrass, is the synthetic grass of choice when water conservation is a factor. In addition, environmental impact is just as important. Synthetic grass encourages outdoor activity without damaging the environment. For instance, a play area covered in NewGrass® is usable after snowfall. How so? Because water drains through. so it sounds like installing NewGrass® in backyard play areas and school playgrounds is a great idea. Furthermore, a recent study published in the online JAMA Archives of Pediatrics & Adolescent Medicine revealed the following. Nearly half of all U.S. preschoolers don’t play outdoors every day! Now consider this quote from the article. So how does synthetic grass encourages outdoor activity? First, it is all weather. Therefore, kids are not just restricted to playing during a certain season. Instead, they can enjoy synthetic grass year round. Second, it is safer than traditional grass. No worry of muddy or stained spots means kids can play hard and long. So with all of these reasons, why not make the switch? We have the product to create an amazing green space. All you have to do is reach out! Contact NewGrass and Make a Difference! And mom? Well she won’t have to worry with green stained clothes. With all of the benefits of synthetic grass, it’s easy to see why so many families and businesses make the switch! Interested or curious? Contact NewGrass today. We will have your kids moving in no time! Our products use the latest industry technology. Therefore, your space will stay green, cool and fade resistant for years to come. In fact, we guarantee it! That’s right, our products come with a warranty. Most are at least 10 years, with some as high as 15! Seems like other good reason to reach out in our opinion. Together, we can make a difference. Plus, you will enjoy all the benefits artificial grass has to offer!